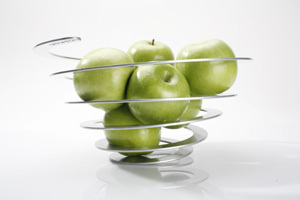 The Poing Fruit Bowl by Ori Saidi and Dani Gassner is modern, spiral shaped fruit bowl. Iron meets origami to create this contemporary design. Laser cut and powder coated in silver matt, the fruit basket is hand stretched to create its futuristic spiral form. As well as functioning as a fruit bowl, Poing can also be displayed on its own as a striking piece of modern art. Material: Iron, powder coated in silver matt. The Garlic Crusher by Ineke Hans is an innovative new take on the tradition garlic press. This award winning one piece garlic crusher is simple to use. Just crush the garlic clove with the flat side of the tool and then spread out the contents by rolling over it. The crusher can also be used for fresh herbs, nuts or ginger. Ribbon is a wall mounted coat rack. Designed to merge function and art, it is inspired by a ribbon blowing in the wind. This modern coat rack can hold up to five coats as well us other essential accessories like scarves, hats and umbrellas. But on its own, it serves as a piece of wall art. Designed by Hemal Patel, the sleek and sculptural coat rack is handmade – meaning no two are exactly the same – and finished in semi-gloss white. Manufactured in powder coated mild steel. Supplied with four screws and wall plugs for wall mounting.